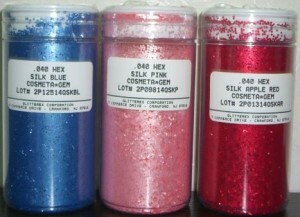 Cosmeta*Gem glitter is a cosmetic glitter that is based on the Poly*Flake and Holo*Gram product lines. This is a line of products which consists of ingredients and colorants that are approved for cosmetic applications. It is a cosmetic additive that adds a whole new dimension to woman’s care products. Properties are similar to those of Poly*Flake and Holo*Gram, except that the colorants may bleed in certain solvents and may fade with exposure to UV and sunlight. 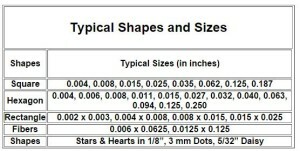 Typical Shapes & Sizes Available by Product Conversion Tabel for Glitter Sizes.